Gallia Academy senior quarterback Justin McClelland (7) crosses the goal line for a touchdown in between a handful of River Valley defenders during the first half of Saturday night’s Week 2 football contest at Memorial Field in Gallipolis, Ohio. River Valley senior Layne Fitch (2) eludes a pair of Gallia Academy tacklers during the first half of Saturday night’s Week 2 football contest at Memorial Field in Gallipolis, Ohio. GALLIPOLIS, Ohio — It forces a pivotal Game 5, but you’ll have to wait a year to see it. 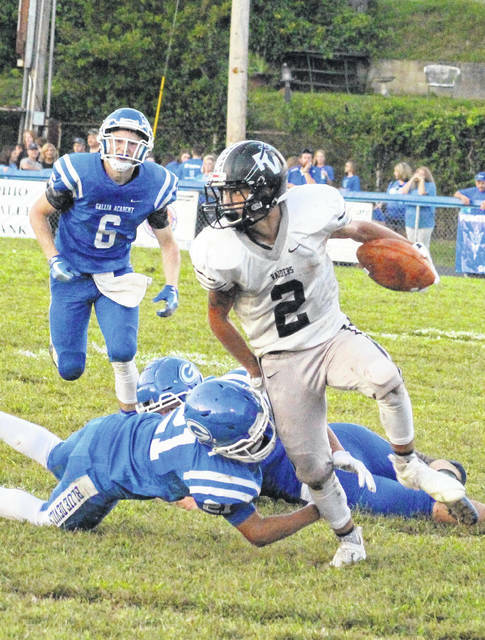 The Gallia Academy football team pulled even in the fourth game of the Ohio Valley Bank Community Bowl series after soundly defeating visiting River Valley 46-0 on Saturday night during a Week 2 non-conference clash of Gallia County programs at Memorial Field. The host Blue Devils (2-0) — who also won last year’s OVB Community Bowl game by a 49-7 margin — needed only 11 seconds to secure the game-winning score and also led 13-0 just two offensive snaps into regulation. The Raiders (0-2) — on the other hand — committed both of their turnovers in the opening half, allowing the Blue and White to turn those miscues into an additional 13 points while building a 26-0 halftime advantage. Gallia Academy tacked on another 13 points in the third and seven more in the fourth to wrap up the 46-point triumph. 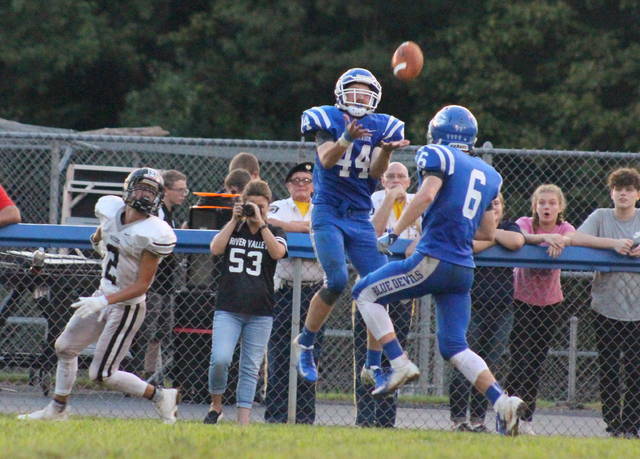 The Blue Devils produced 200 more yards of total offense, finished plus-2 in turnover differential and had seven different players reach the scoring column in the lop-sided outcome. 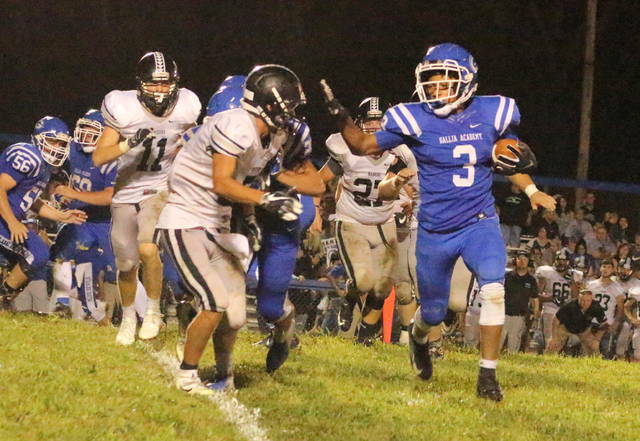 More importantly, it allowed the Blue Devils to start the season 2-0 for the first time since the 2010 campaign — something that second-year GAHS coach Alex Penrod was unaware of at the time. Nonetheless, he was aware that Saturday night’s outcome took on a special meaning — both on the field and historically — due to the nature of the contest. Penrod is also aware that there is another rivalry game looming in the near future. The Raiders — who won the first two OVB Community Bowl contests by counts of 27-13 and 20-7 in 2015 and 2016 — had 53 offensive plays from scrimmage, and 15 of those plays resulted in either a turnover or a loss in yardage. River Valley did cross over into GAHS territory on almost half of its nine offensive drives, but the guests never got closer to the goal line than a second-and-eight situation at the 10. The Raiders lost yardage on the next three plays before ultimately surrendering the ball over on downs midway through the first quarter. The game started with fireworks as James Armstrong returned the opening kickoff 83 yards for a 6-0 edge with 11:49 remaining, then the hosts forced punt and needed only two plays to increase their lead out to two scores. Lane Pullins rumbled 51 yards on a second-and-10 run that made it 13-0 with 7:21 left in the opening stanza. The Blue Devils recovered a fumble with 2:16 left in the first, then needed only four plays to cover 35 yards for a three-possession cushion. Justin McClelland ran the ball in from a yard out with 1:33 remaining en route to a 19-0 lead. Both teams traded punts, then River Valley strung together a drive that led to a second-and-10 at the hosts’ 16. Cole Davis came down with a corner lob in the end zone and took a knee, completing an interception that gave the Blue Devils the ball at their own 20 with 4:51 left until halftime. The Blue and White followed with a 17-play, 80-yard drive that yielded another score as McClelland found Cory Call on a three-yard lob pass in the back of the end zone with no time remaining. Andrew Toler tacked on his second successful point-after try in the half, allowing Gallia Academy to go into the locker room ahead 26-0. Facing a fourth-and-three on its opening drive of the second half, River Valley elected to go for it at its own 27-yard line. The end result was a run that yielded a 23-yard loss and a turnover on downs, giving the hosts the ball at the four. Jacob Campbell received a handoff on the ensuing snap and covered the four-yard distance with 10:25 showing in the third period, making it a 32-0 contest. Pullins capped a five-play, 40-yard drive with a one-yard run at the 5:45 mark for a 39-point lead. Daneuvyn Woodson capped the scoring on a 16-yard run with 2:19 left in regulation. Gallia Academy outgained the guests by a 337-137 overall margin in total yards of offense, including a 263-121 advantage on the ground. The hosts also produced a 74-16 edge in passing yards, as well as six more first downs (17-11) over the course of the night. It was a tough night for RVHS coach Jason Peck, who acknowledged that were some pluses and minuses to take away from this game. Still, the first-year mentor believes that his kids are trending up after battling a pair of stiff opponents — despite what the record might otherwise indicate. “I want to congratulate Gallia Academy on that one, both the players and the coaches. They have a lot going for them over there and they are definitely headed in the right direction,” Peck said. “On our end, we still need to show some more mental toughness … but I definitely appreciate the effort our boys gave. We found out that we have some warriors tonight, and that’s going to pay off. After battling through a slow start during his first season at Gallia Acadmy, Penrod also believes that the Raiders have some good days — and years — ahead with Coach Peck at the helm. Pullins led the Blue Devils with 112 rushing yards on 12 attempts, followed by Michael Beasy with 50 yards on five carries and Armstrong with 37 yards on four totes. McClelland was 7-of-12 passing for 74 yards, throwing one touchdown and zero interceptions. Call led the wideouts with 39 yards on four catches. Toler was also 4-of-5 on extra-point tries. Cole Young — who left the game midway through the first half due to injury — paced the Raiders rushing attack with 41 yards on four carries. Will Hash was next with 38 yards on nine attempts, while Jordan Burns had 20 yards on nine carries to go along with a 1-of-4 passing night for 16 yards and a pick. Fitch had River Valley’s lone catch, a 16-yarder midway through the second quarter. The Silver and Black also had three of the five punts in the contest. The Blue Devils own an 11-3 record all-time against River Valley. Gallia Academy takes a four-game regular season winning streak into the Apple City next Friday when it faces former SEOAL-foe Jackson. Kickoff is at 7 p.m. 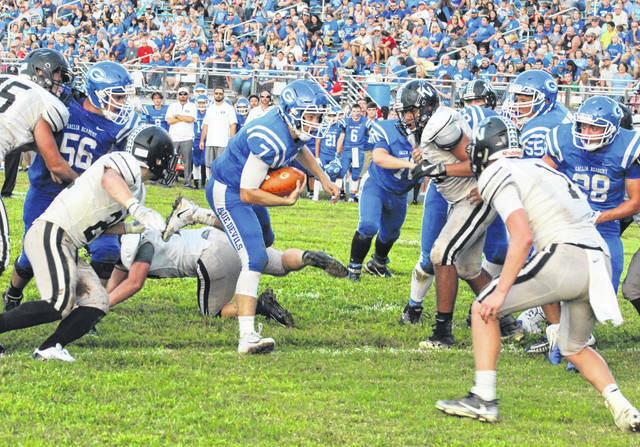 The Raiders — who haven’t started a season 0-3 since 2013 — will try to snap a five-game regular season losing skid on Friday night when they host Portsmouth in a non-conference contest at 7:30 p.m.